Led Zeppelin’s eighth tour of of the US was one of their most intense, both in terms of schedule and in performance. With eighteen shows in about three weeks, they produced concerts so wired that thirty years later it produced an official release. The concert in Charlotte is the third of the tour (discounting the June 8th Boston show since no evidence ever surfaced proving it took place). The first silver release was an incomplete fragment of the show on Acoustic Tales In Charlotte (SIAE CS.CD.10-003) which has “Tangerine,” “That’s The Way,” “Bron-Yr-Aur Stomp,” “What Is And What Should Never Be,” “Whole Lotta Love,” “Rock And Roll,” “Communication Breakdown,” and “Dazed And Confused” out of proper sequence. Don’t Do It If You Don’t Want To (Holy Grail HG-104/105) and Knees Up Mother Brown (Image Quality IQ-024/025) both have the entire show but run a bit fast. Compositions (Tarantura CC-001, 2) was issued in the summer of 1997 and is one of the final titles released by the original Tarantura label. TDOLZ released their versions two years afterwards and the sound quality is on par. It runs at the correct speed and is a clear, crisp mono recording. There are numerous cuts scattered throughout the tape but most of it is present. The tapers hold conversations throughout the show which serve as an interesting commentary of the event. It was not a sell out and the audience are very quiet and perplexed throughout the first half of the show. The tape picks up right before “Immigrant Song” which is segued directly with “Heartbreaker.” At the end of the second song Page breaks a string on the guitar and instead of just waiting around doing nothing the band play “Celebration Day” on which he uses the double neck. A regular in the 1971 set, this song was dropped from the new set list and was played in Brisbane and Amsterdam before Charlotte. Page flubs the first solo but plays a meditative solo at the song’s conclusion. Afterwards Plant says, “Alright, we got the string fixed. It’s really nice to be on holiday again. After ten months in England it gets…” He gets distracted by Bonham warming up and then goes into the usual story of “Black Dog.” Plant’s speech before “Since I’ve Been Loving You” is cut but the taper gives a remark about the police in the crowd. When the come back for the second encore Plant says, “Right. We were just on our way to the airport and we couldn’t do it.” “Liar! !” someone loudly shouts. 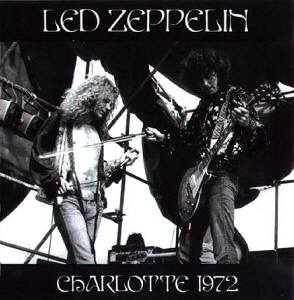 Charlotte 1972 is packaged in a glossy cardboard gatefold sleeve. The photos on front and on the inside are from the Sydney show the previous February, but the photo on the back is from taken from the acoustic set in San Diego. The black and white photos on the black background give it a stately feel. This is a good production of a good but very bizarre and frustrating concert. Any clear tape from this tour is good to have and TDOLZ is worth having.